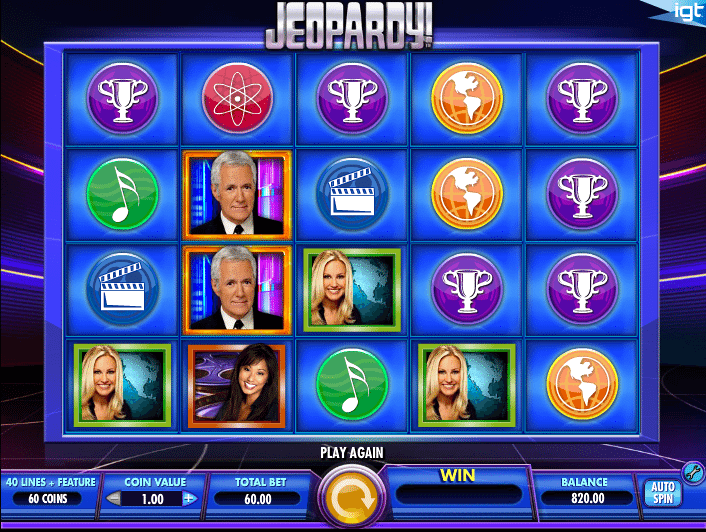 The Jeopardy Slots is a new game inspired by the Television game show. It has good graphics many that are based off of the show. The sounds in the game also are a good representation of the TV show. It can have a very large payout while betting the max, but it is more common to have smaller payouts and smaller losses. There are many different winning schemes, however the five different reels can make winning harder. If you want to win big I suggest playing the max bet, but I found myself having more fun playing the minimum and trying to gradually win. You can bet on one line all the way up to 4 lines. The max bet for this game is forty five. The Jeopardy wild symbol is the “Double Jeopardy, 2X wild icon” and it will double your score along with substituting for all other symbols. While playing it comes up somewhat often but doesn’t automatically mean you win. This exciting bonus game is triggered by accumulating three “jeopardy bonus” icons on a pay line. The board is made up of thirty Jeopardy screens. Click on screens to reveal your reward, and by revealing a double jeopardy you can multiply your score by 2. You can keep playing and winning until the Final Jeopardy screen is reveled. In this bonus screen you have a good chance to win some cash. If you are unsatisfied with your bonus you can always play until you get the bonus again. This time try to pick the right screens for a higher score and you will see your cash will be rising along with the fun you’ll be having. How can you make quick cash while having fun? What is Jeopardy Slots? Have fun!